Donald Trump's candidacy has been littered with conspiracy theories. There has been speculation that Trump is trying to ensure a Hillary Clinton victory, that he is trying to take down the GOP from within, or that he wants to use the presidency for financial gain. Now, the presumptive Republican nominee has announced that Indiana Gov. Mike Pence will be his running mate, and there are some people who think that the Trump-Pence decision only proves the conspiracies that have been circulating for months. Bustle has reached out to the Trump campaign for comment on the theories. One particularly popular theory that has emerged in the aftermath of Trump's announcement is that Pence completes his image as a hateful bigot. 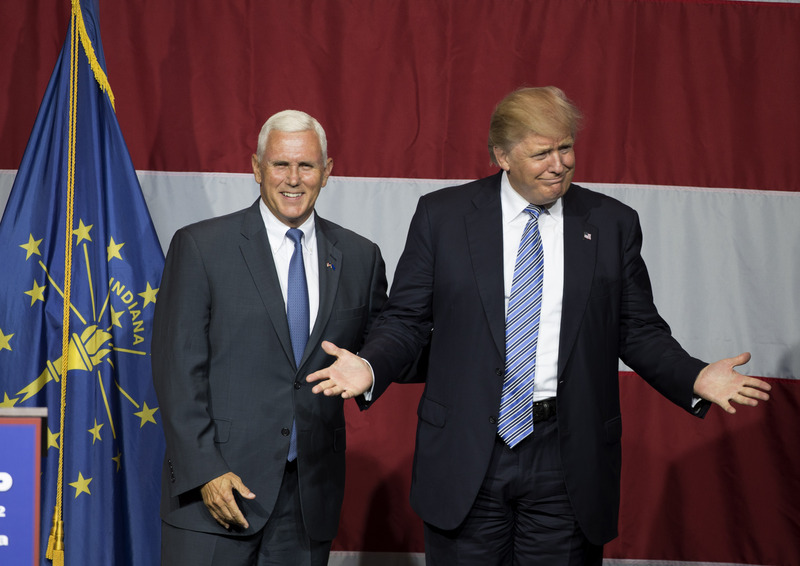 More specifically, Trump's racist and anti-immigrant sentiments have been widely publicized, while Pence is well-known for anti-abortion and anti-LGBT rights positions. This idea is valid in that Pence can make the thought of a Trump presidency even more palatable for extreme right-wingers, but the conspiracy theories lie in the implications of this idea. Here's what some conspiracy theorists are wondering: Does picking Pence — and subsequently giving off an even more bigoted image — make Trump a secret Clinton supporter? Does it mean that Trump is trying to further destroy the GOP's image by becoming even more extreme? Or does it mean that Trump is actually a liberal who is combining his support of Clinton with Pence's bigoted views to throw the election and take the GOP down with him? This theory has been circulating ever since Trump started vocalizing his views. The idea behind this theory was that Trump would run for president and make himself look so bad that Clinton would be the only viable choice. Why would anyone think this? Because Trump was a Democrat for a part of his life, and he previously counted himself among Clinton's friends and supporters. Adding Pence to the equation apparently only cemented this theory — Trump already espouses so much extremism that having Pence as his VP pick only exacerbates his bigotry. The theory goes that Trump could have chosen someone who wasn't as bad, but that in picking someone like Pence, he's essentially throwing the election to Clinton. The theory that Trump is secretly a Clinton agent goes hand in hand with the belief that he has secretly been trying to destroy the GOP from within this whole time. The reasoning behind this belief is that a Trump-Pence combination is too extreme even for the GOP, and that the refusal of many top Republicans to back his candidacy will tear the party apart. And if their joint candidacy does in fact "throw the election to Clinton," that would also be harmful for the GOP, which desperately wants a candidate in office now that President Obama has served two terms. Is there any truth to this theory? Probably not. As mentioned, Bustle has reached out for comment. But we'll just have to see what happens during the Cleveland GOP convention and the general election period — still other conspiracy theorists think that Trump might drop out after it's too late for Pence to seek reelection in Indiana, which would hand Clinton the election, while also delivering another blow to the GOP. None of this should stop us from critically thinking about what a Trump-Pence administration would look like, though, because if it does actually come to pass, most of us will have a lot more to worry about than whether or not this is all a ruse.